“Picklists” are the drop-down lists of choices that display on various screens. Many of these sets of choices are editable by you. Those that you can edit are listed in the Picklist Management menu item. Navigate to the Picklist Management menu item. Select the picklist whose choices you wish to edit by clicking on its Picklist Name. The selected Picklist Detail Screen displays. To edit any of the choices in the Picklist, simply click on its name. The Picklist item detail screen displays. This will vary depending on what kind of picklist and items are involved. In the particular case we have used for illustration, the picklist is Entity Types, which displays on the Order screen and is used to select patients, physicians, facilities, etc. Therefore, the detail screen for each Entity contains more functionality than most, including the Entity Assignment frame. This area displays all of the people or other entities who are assigned that Entity Type. These may be edited here, as an alternative to editing them in Patient Management. Each type of picklist is edited differently, as stated earlier. Pretty much all of them involve naming a choice and making it active (checkbox) and saving each new item. There will always be a New, and Remove or Delete option, along with a Save function. 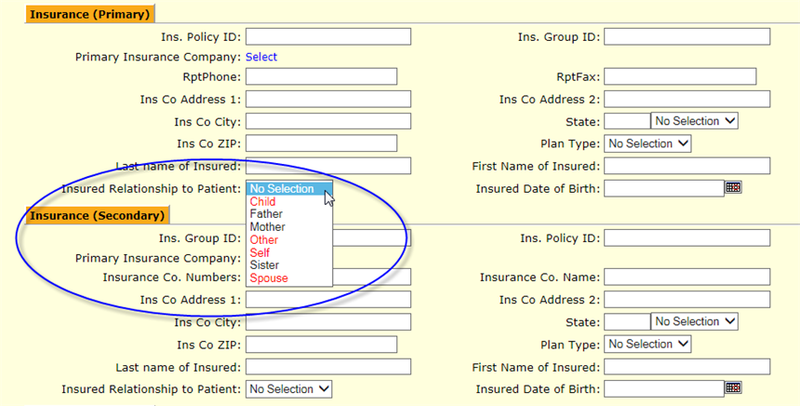 In the example below, the Insurance Relationship picklist lets you define various choices of the relationship of the insured to the patient (this drop-down field displays on the Patient Management Detail screen). These are added by entering a new choice in the New row (top) and checking the Active box. Any picklist choices not made Active will not display in the drop-down list of choices. They may easily be made to display again by saving them as Active, so it is not necessary to delete any previously-defined choices. Below, we can see the choices added (in black) to the standard choices (in red), as displayed on the applicable screen during use. Note that the choice of “Brother” does not display because it was not made Active.